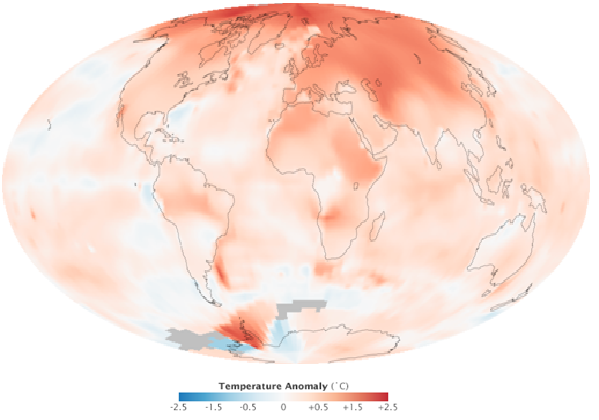 Global warming is the rise in the average temperature of Earth's atmosphere and oceans since the late 19th century, and its projected continuation. Since the early 20th century, Earth's mean surface temperature has increased by about 0.8 °C (1.4 °F), with about two-thirds of the increase occurring since 1980. Warming of the climate system is primarily caused by increasing concentrations of greenhouse gases produced by human activities such as deforestation and the burning of fossil fuels. Where we will burn the hydrocarbons and produce CO2methane etc. 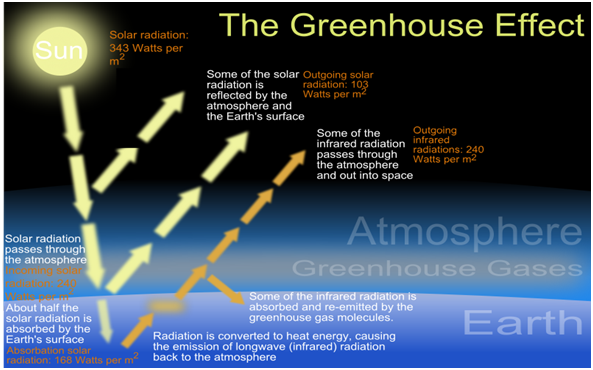 The cause of temperature rise due to GHG is described in figure below. An increase in global temperature will cause sea levels to rise and will change the amount and pattern of precipitation, as well as cause a probable expansion of subtropical deserts. Now a days we can see the effect of climate change mainly in japan and other mountainous countries as like Nepal there are so many landslides and flood problem due to high intensity rainfall on short time. Also in Nepal the snow line is shifting up and the perennial rivers are going to draught that directly hit to the agriculture and hydropower generation also the ecosystem will be in disorder. The change of average temperature during 10 years (2000-2009) is shown in figure. Emissions of GHG are mainly due to the burning of fuels and other activities like that so its concentration is high in developed countries like USA, China, Brazil etc. above figure shows about the total GHG emission by the country. 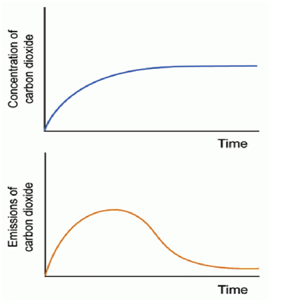 This graph shows for the constant atmospheric condition we have to reduce the carbondioxide emission drastically. We cannot reduce energy consumption on that way that will adverse the economic growth and sustainibility, hence we have to find out the different mechanisms to reduce the emission of GHG into the atmosphere. There are some methods to store CO2 in to the ground after separating from the purification plants of oil. One of the options that can be used to combat climate change is to capture CO2 produced by power generation and industrial processes and store it deep underground, a process known as Carbon Dioxide Capture and Storage (CCS). 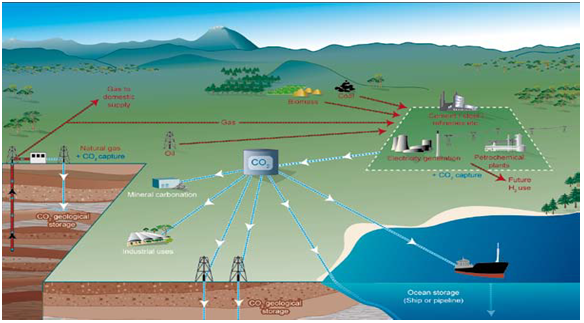 CCS involves capturing the CO2 produced by the burning of hydrocarbons (e.g. coal and natural gas) before it enters the atmosphere, and storing it in deep underground. The main components of CCS are: capture (separation from the gas stream) at a power plant or an industrial source, compression and transport via pipeline and injection of fluids (at the pressures associated with CCS injection, CO2 is a fluid rather than a gas) into an underground storage formation through a well.Following fig shows the mechanism of CCS. Capturing of the CO2 from its sources is the first step in CCS. It is possible to capture from the atmosphere also but it will not be the feasible from economic point of view. Mainly there are three primary methods to capture the CO2. Post combustion, Pre combustion and Oxy-fuel combustion.This following schematic diagram shows the processes. 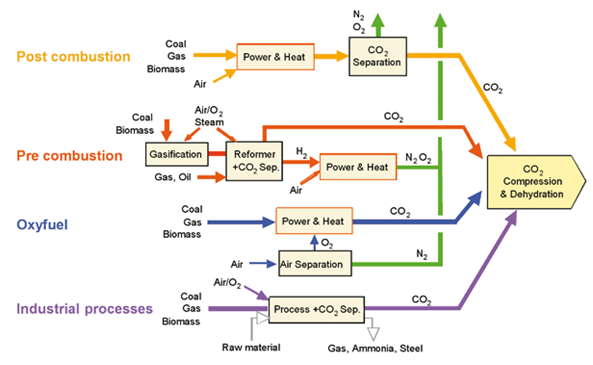 In post-combustion capture the CO2 is removed after the combustion process, it is directly separated from the flue gas, after power generation has taken place. This means that little modification is needed to the industrial equipment, as the capture plant is bolted to the end of the process. CO2 is captured prior to the burning of fossil fuels in pre-combustion capture. One of the advantages of capturing the CO2 before burning is that the technique separates hydrogen from the fuel/gas. Hydrogen is a ‘clean’ fuel, producing only water when burned, and can be used itself as a fuel. A downside to pre-combustion capture is that it requires a relatively large amount of modification to the power plant, and is therefore harder to retrofit (that is fit capture machinery to existing power plants). The scheme is generally applied to new fossil fuel burning power plants, rather than converting existing plants. In the oxy-fuel combustion process the fossil fuel is burned in an environment of almost pure oxygen rather than air, which means the resulting flue gas, is made up of mainly CO2and water. The technique is promising, but the initial air separation step requires a lot of energy.The benefit of this process is that the CO2 contains far fewer other substances, and therefore requires much less processing to remove impurities before it is stored. Oxy-fuel combustion is at a relatively early stage of development, although there are now a small number of large scale demonstrations ongoing around the world. It is not necessary to be the captured area is just above the storage geology so if it is different then Captured CO2 has to take from captured station to storage area by using pipeline or vehicle which will be efficient and viable. Captured CO2 will be in liquid form hence we have to consider the safety for the environment. For the storage of CO2 mainly we use internal part of the earth it will help the recovery of the oil pores after its drawing. 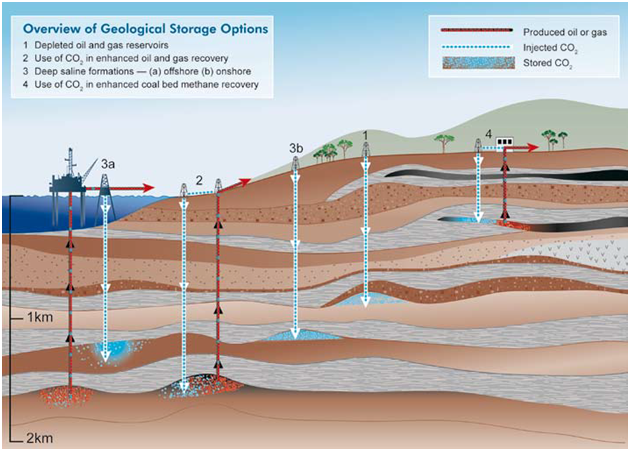 There are three types of storage systems oil and gas reservoirs, deep saline formations and unminable coal beds. This figure explain about the storage of CO2 . There are some risks of releasing of stored CO2due to some geological fractures but these are very rare case. Effect of CCS on global warming. This CCS method contribute the 80-90 percent carbon dioxide emitted from the oil industries will store at deep ground hence thousands of tons per day will go to store without emitted on atmosphere. It will provide control over CO2and reduce the increase of GHG that will cause slow down of rate of adverse effects by climate change. Some statistics of CO2 injection is presenting below. Hence we can see the CCS is very effective method to store carbon dioxide. But we have to research on the other way to convert CO2 and use in life of human that will give the stability for long term.